Cards for Men is having Challenge # 7 - April Fool's. The premise is humor. 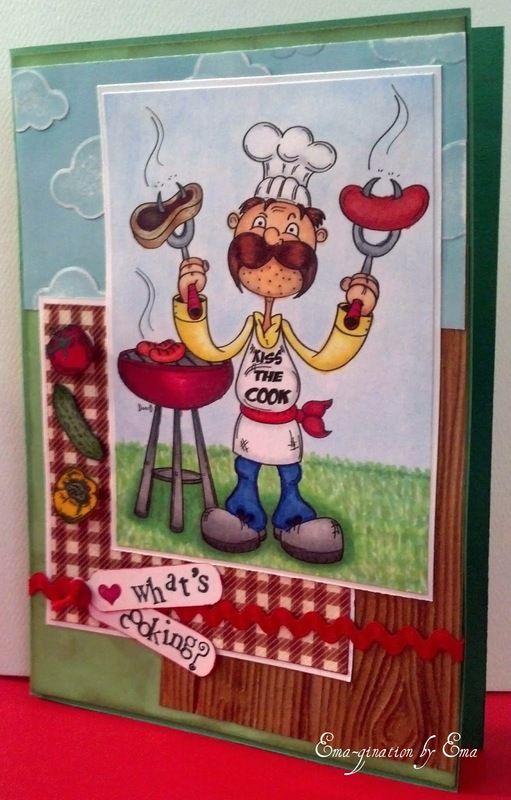 :) Who cannot laugh when looking at this Kiss the Cook image from Just Inklined? It definitely brought a smile to my face for sure! I used plain and embossed card stock, ribbon, button and twine from my stash. Cuttlebug wood grain embossing folder and Darice cloud embossing folder added texture to the background card stock. I colored the image with Copic markers. The sky background on the image was accomplished with Pebbles chalks. The small stamped vegetables and alphabet used on the sentiment both come from unknown stamp sets. The tomato and bell pepper pop off the card with foam tape. Wow - What a great fun card.